Let us move you there! The benefits of having our company move your items long distance are that we treat your long distance move just like we would a local move. 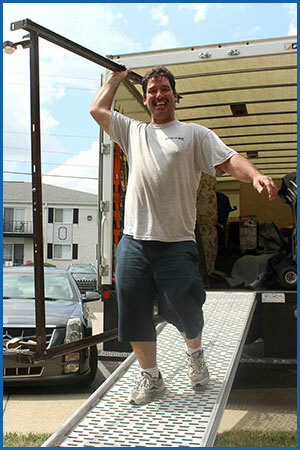 Men on the Move will load your items and deliver them to your new address the same day or the day following loading. You have exclusive use of our truck, meaning that your furniture will be at your new location faster than many other movers that split loads. The same people that load your items onto the truck will be delivering and unloading your items. Rest assured that your belongings will be handled with care, but just in case something unthinkable were to occur, we are insured and bonded. We also offer our out of state moving customers 25% of all boxes and packing supplies. In addition to being a full service moving company serving local and statewide moves, Men on the Move offers packaging, loading, and unloading for our clients preferring to move themselves. The benefits of having our company move your items long distance are that we treat your long distance move just like we would a local move. Men on the Move will load your items and deliver them to your new address the same day or the day following loading. You have exclusive use of our truck, meaning that your furniture will be at your new location faster than many other movers that split loads. For your convenience, Men on the Move carries an assortment of boxes and moving supplies to help you protect all your valuable possessions. We have all the essentials: boxes, packing paper, bubble wrap, paper pads, and more. All reasonably priced. Supplies are available at our Westland or Ann Arbor locations. Which one? We offer service to several states around the United States! Below is a listing of all of the states that Men on the Move currently provides service to.